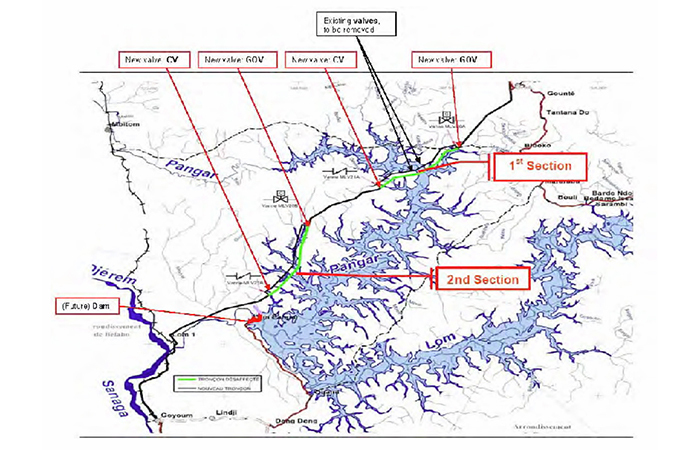 The existing Chad-Cameroon Pipeline system (CCPS) is a crude transfer 30” line from Chad to Cameroon coast. The CCPS originates at the Pump Station 1 scraper launcher within the Central Testing Facilities (CTF) near Kome in south-western Chad and extends to the shoreline tie-in with the offshore pipeline leading to an offshore loading facility off the coast of Cameroon. Total length 1070 Km with 890 Km within Cameroon. Because of the construction of a dam at the confluence of the Lom and Pangar rivers, Company has decided to replace the two flooded sections of pipeline. Design of a temporary bridge to cross the Pangar River during site construction.